Nicole graduated with a Bachelor of Occupational Therapy from the University of Queensland in 1985. She has worked as an Occupational Therapist at the Mater Adult and Prince Charles Hospitals and as Senior Occupational Therapist at the South Brisbane Centre for the Workers’ Compensation Board of Queensland. Nicole then moved into Private Practice with Active Rehabilitation in 1994, specializing in the splinting and management of hand injuries, work injury assessment and return to work management, including medico-legal assessment. In 1996 Nicole was employed by the University of Queensland Occupational Therapy Department. Here she developed their new Work Assessment and Rehabilitation Unit, was involved in a research project, which developed a new Functional Capacity Evaluation Testing Instrument and employed as a part time Lecturer and Tutor. 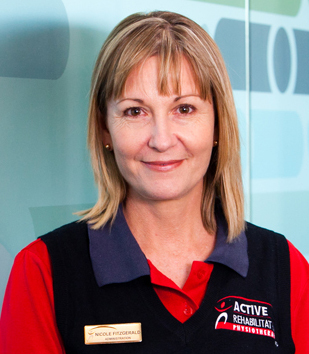 In 1999, with the growth of Active Rehabilitation Physiotherapy, Nicole came on board full time, to assist her husband John in Practice Management.